The latest figures on economic growth released by the Bureau of Economic Analysis (BEA) are bad. Yes, GDP growth has surged to 5.7% in the fourth quarter of 2009. But the contributions of investment, government expenditures, and net exports are almost nigh. Personal consumption expenditures has added 1.4 percentage points to growth, down from 2 percentage points in the third quarter. (See Chart 1.) The largest contribution (3.4 points out of 5.7) comes from the change in private inventories, i.e. the variation in the stockpiles of goods that businesses store. An increase in inventories adds to GDP, because those are goods that are produced but not sold, and therefore not included in expenditures; a decrease in inventories, on the other hand, must be subtracted from growth, because those goods were already counted in GDP at the time they were produced. What is wrong with having more than half of our growth coming from inventories? First of all, in the medium term we are probably going to see inventories decrease more, not less, on average. 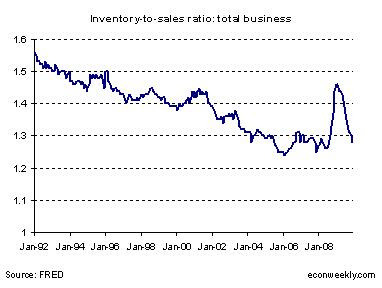 Current inventory levels, as measured by the sales-to-inventory ratio, are too high relative to their long-term trend. (See Chart 2.) True, inventories plummeted through 2009, but that was just a correction to the excess stockpiles accumulated during 2008. Taking the recent trend of the sales-to-inventory ratio as benchmark, we should now be closer to 1.2 than to the 1.28 where we actually are. In the near term, therefore, and on average, we should expect net declines in inventories. Secondly, (optimistic) observers may have claimed that the positive contribution of the change in inventories is a sign that businesses anticipate an increase in demand. In fact, the present behavior of inventories is just a reflection of the economic past: businesses are increasing stockpiles, or at least reducing them more slowly, because consumption expenditures have picked up over the past six months. In other words, businesses are best characterized as backward-looking creatures. 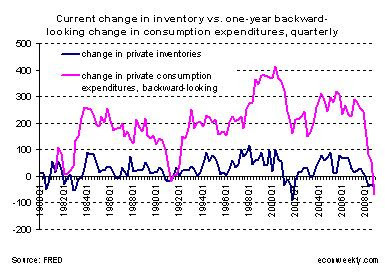 There is a strong correlation between current changes in private inventories and the past increase in personal consumption expenditures (PCE). (See Chart 3.) In fact, using quarterly data, the correlation coefficient is around 0.7. The correlation between changes in inventories and future PCE growth, on the other hand, is only 0.4. Saying that increases in inventories forebode stronger demand in the near future is almost wishful thinking. Finally, and this is a lesser point, estimates of changes in inventories are unreliable. Remember, the figures released by the BEA last Thursday are only advance estimates: over the next two months the government will release two revisions: the preliminary estimate and the final estimate. The “final” estimate will be revised again a few months down the road. Based on recent experience, substantially lower or higher revised figures for changes in inventories should not surprise us. Since 2006, for example, the average difference between the advance estimate and the “finally final” estimate has been $13 billion; the average absolute difference has been $4 billion –in the fourth quarter the change in inventories was -33.5 billion. It presents the decomposition of euro area GDP growth rates by expenditure components. 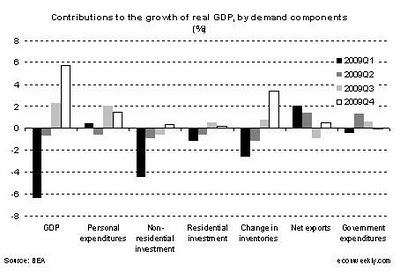 If domestic demand is met by imports, this indicates lower domestic production and thus a lower GDP.